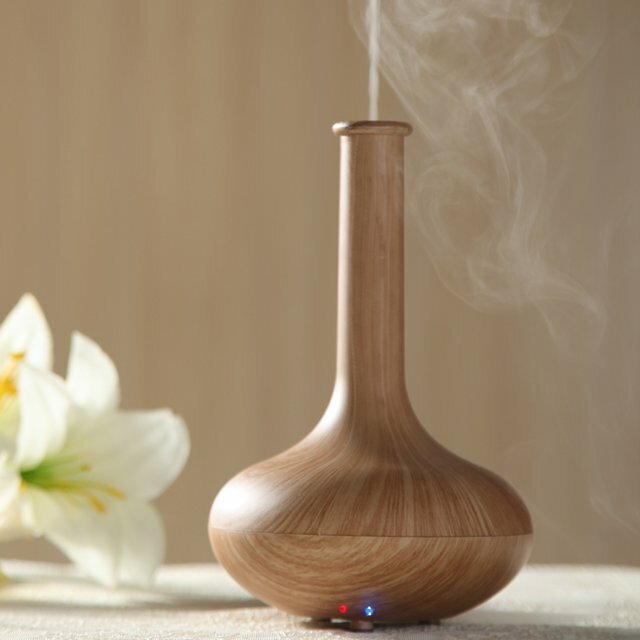 You are here: Home / Aromatherapy / How Does an Essential Oil Diffuser Work? There are a few different types of essential oil diffusers however many of them work in similar ways. After using a few we can confidently say that the differences in how they work which affects the benefits we get from them. We can see how their subtle variances offer a wide range of options to choose from. Some of the variances in how diffusers work mean that some options are generally better than others. Overall nebulizer and ultrasonic essential oil diffusers seem to work best. This might be because they don’t use heat as their primary function. We have pulled together how each of these essential oil diffusers work so you can make the choice that’s best for your room! So, this is the most simple setup for a diffuser. Essential oils are dropped onto a pad and then a fan blows over it spreading the oils into the air. The immediate downside is that some oils dry up or dissipate much faster than others. But, if you’re looking for something for your car this is a top choice. It is low on energy and there are a ton of variations for car vents available already. Heat diffusers operate in a very similar way to humidifiers. It uses electricity or a candle to heat a pool of either pure essential oils or a blend of oils in water. The difficulty that this causes for many is that the chemical foundation of the oils is altered by heat. So you don’t get all the benefits that you should be from essential oils. The benefit? These are some of the most appealing if you’re looking to add a decorative feel to the room as well. Often heat diffusers, especially the candle diffusers have a more comforting look than the new, modern, looking ultrasonic diffusers. 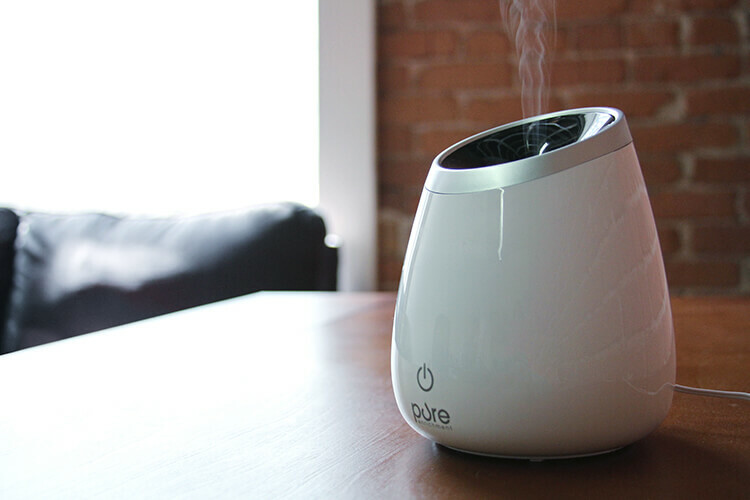 Unlike many of the other common types of diffusers, a cold air diffuser mixes the room’s air with oils in a nebulizer where it is then turned into vapor. What this means is that it takes the air, then using a fan propels it into a nebulizer after it goes over a pad that has essential oils on it. So, it is kind of like a mixture of a nebulizer and evaporative diffusers. This thing is noisy though! It also is a bit of a mess. 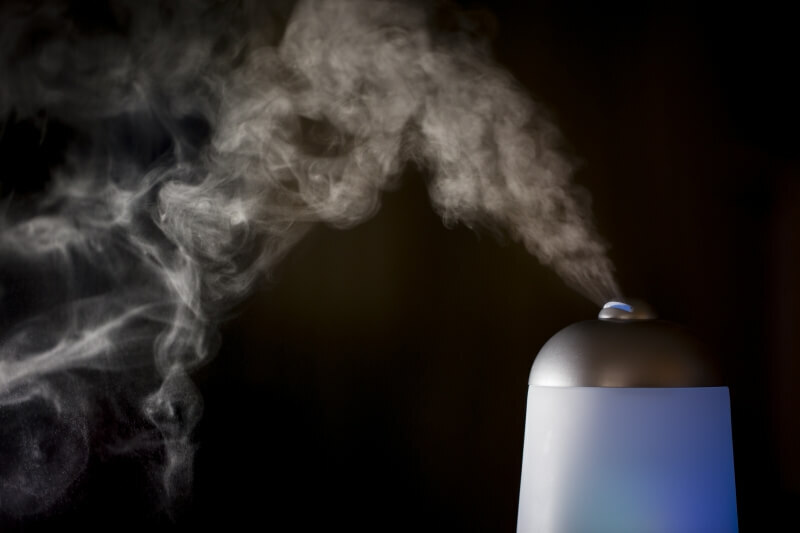 The cold air diffusers do deliver a powerful scent and retain the oils a bit better than the evaporative diffusers. However, the mess and noise are enough to drive us away from most of them. If you’re set on a cold air diffuser we definitely recommend evaluating some of the higher quality options and checking out the reviews! These diffusers are probably the most common household type diffusers. They also work as a very mild humidifier as well. Ultrasonic diffusers use water just like many of the other diffusers do, however they don’t use heat the same way. Yes, they plug into the wall. But instead of heat, they use the electronic frequency to create vibrations which pull the essential oils to the top of the water. After the oils are established at the top of the water the vibrations then vaporize the water and oils. They mix in the air and work almost like a humidifier. The stream of water and oil being released into the air can escalate a lot of the benefits from the essential oils that you’re already using. Because it’s just mixing with water and not being subjected to heat you get the benefits in an uncompromised way. Another benefit is that it will seem like your essential oils are last longer. This is because they’re being diluted in water and dispersed over a period of time. These are regularly recognized as the most powerful option when you’re searching for an essential oil diffuser. Unlike common types of essential oil diffusers, they don’t need heat or water. A nebulizer diffuser uses an atomizer, which creates a thin stream of airborne particles. These fine particles are then blown through the room with a quiet fan dispersing them into the air. These are especially great if you’re sick! When you get a continuous stream and use rosemary or tea tree oil you can help boost your immune system. Essential oils remain more concentrated than using a more common type of aromatherapy diffuser. These usually have the option to set specific times to run and auto shut-off. There is no water which means you’re not at risk of ruining furniture or burning yourself in a spill. Unfortunately, the use of an atomizer also means that it is louder than most other types of diffusers. You will also see essential oils be used up much more quickly as they aren’t diluted with water. All diffusers operate with the same idea of well, diffusing, the essential oils into the nearby air. The methods used are either fans, heat, electric waves (ultrasonic), or streaming the oils through a nebulizer. What we’ve seen overall is that the ultrasonic and nebulizer options definitely work harder, and deliver quality benefits more consistently. However, this doesn’t mean that a cold air or heat diffuser isn’t a great option. Now that you know how essential oils diffusers work you’re ready to go and hunt down the one that’s right for you!